To recognize the diligence, dedication, and skill of library staff and librarians, the Tuesday of National Library Week has been designated National Library Workers Day! Don’t worry, he actually enjoys his work and loves books. He just always looks like that. So, if you are a library patron, consider giving your favorite library staff members a, “Good job,” or a, “Thank you for all your help,” today. Maybe even consider nominating them as a Star Library Worker. We’re celebrating us this week by celebrating the reason we’re are here in the first place, YOU! And how better to celebrate you than by showing our appreciation by making DVD and video game checkouts FREE all week long! Time to close the blinds, turn off your phone and have that MCU movie marathon you’ve been planning before going to see Avengers: Endgame. Don’t worry, the nice spring weather will still be there when you emerge – it’ll probably be even nicer! If you haven’t already voted, today is the day! Friends of Libraries groups have their very own national week of celebration! 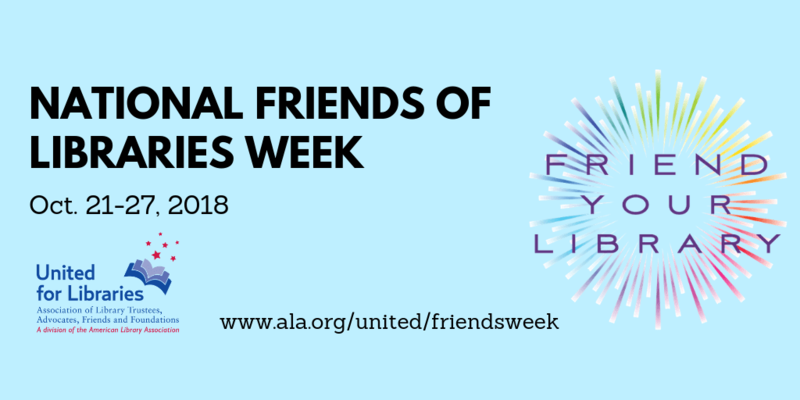 United for Libraries will coordinate the 13th annual National Friends of Libraries Week Oct. 21-27, 2018. We just wanted to take a moment to thank the Friends of the Moline Public Library. Their volunteer-run book store and fundraisers provide invaluable supplemental funding for the library and its programs. Their time and effort have translated to hundreds of thousands of dollars that the library was able to use to give back to the community. If you want to support the Friends and the Moline Public Library stop by during National Friends of Libraries Week and check out their Silent Auction and Raffle that’s happening in the lobby. And while your at it you might as well vote while your here! … to sign up for a LIBRARY CARD! September* is National Library Card Sign-Up Month! Now that we have waited long enough to make you last minute dash to sign up look suitably dramatic and heroic, we’re here to remind you to come into the Moline Public Library (or your home library if you don’t live in Moline) and get your library card. All you need is an ID and proof of address and you will be able to check out thousands of books, movies, music CDs and more in addition to gaining access to several online resources and e-material collections. You can learn more about applying on our website. * You can sign up for a card any other month too, of course, there’s just something special about doing it in September. CELEBRATE NATIONAL LIBRARY WEEK, 2018! Every day, libraries of all types prove that they are powerful agents of community change. No longer just places for books, libraries now offer a smorgasbord of free digitally-based programs and services, including 3-D printing, ebooks, digital recording studios and technology training. The National Library Week 2018 celebration will mark the 60th anniversary of the first event, sponsored in 1958. Celebrations during National Library Week include: National Library Workers Day, celebrated the Tuesday of National Library Week (April 10, 2018), a day for library staff, users, administrators and Friends groups to recognize the valuable contributions made by all library workers; National Bookmobile Day, celebrated the Wednesday of National Library Week (April 11, 2018), a day to recognize the contributions of our nation’s bookmobiles and the dedicated professionals who make quality bookmobile outreach possible in their communities, and Take Action for Libraries Day, a national library advocacy effort observed for the first time in 2017 in response to proposed cuts to federal funds for libraries. On Monday, April 9, the 2018 State of America’s Libraries Report will be released. The report includes the much anticipated list of Top Ten Most Challenged Books of the previous year, compiled by the American Library Association’s Office for Intellectual Freedom. Misty Copeland serves as 2018 National Library Week Honorary Chair. In August 2015, Copeland was promoted to principal dancer at the American Ballet Theatre, making her the first African American woman to ever be promoted to the position in the company’s 75-year history. Copeland is the author of the New York Times bestselling memoir “Life in Motion,” and her 2014 picture book “Firebird” won the Coretta Scott King Book Illustrator Award in 2015. Her new book, “Ballerina Body,” an instant New York Times Bestseller, published in March 2017. She has worked with many charitable organizations and is dedicated to giving of her time to work with and mentor young girls and boys. She was named National Youth of the Year Ambassador for the Boys & Girls Clubs of America in June 2013. In 2014, President Obama appointed Copeland to the President’s Council on Fitness, Sports, and Nutrition. And in 2015, she traveled to Rwanda with MindLeaps to help launch its girls program and to establish The Misty Copeland Scholarship. Head to your public, school or academic library during National Library Week to see what’s new and take part in the celebration. Libraries across the country are participating. 2. Show your support for libraries on social media. Follow I Love Libraries on Facebook and Twitter and the hashtags #NationalLibraryWeek and #LibrariesTransform to join the celebration on social media. Post National Library Week graphics to your social media channels. National Library Week is the perfect opportunity to tell the world why you value libraries. This year, in keeping with the Libraries Lead theme, we’re asking you tell us how the library led you to something of value in your life. Library lovers can post to Twitter, Instagram, or on the I Love Libraries Facebook page during National Library Week for a chance to win. Entries can be a picture or text. Creativity is encouraged. Just be sure to they include the hashtags #LibrariesLead and #NationalLibraryWeek for a chance to win. One randomly selected winner will receive a $100 gift card and a copy of “Firebird,” the Coretta Scott King Award-winning book by Misty Copeland, our National Library Week Honorary Chair. Join in the fun. The promotion begins Sunday, April 8 at noon CT and ends Saturday, April 14 at noon CT. Check out the National Library Week page for details and more ways to celebrate.